Courier services seem made for the internet. Advanced functions such as shipment tracking, interactive price lists, and on-line ordering simplify the lives of many customers. But operators sometimes forget that, on the internet, more information is usually better than less. DHL is one of the best-known international couriers, so not surprisingly, its web site is one of the best you’ll find online for this type of service. It contains comprehensive, up-to-date information – how to become a client and how to fill in the forms (which can be downloaded from the site), descriptions and pictures. There is no search function, but a “Table of Contents” shows the site’s structure, including subsections. There is also a free application for downloading, in order to facilitate the sending of packages. 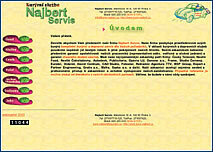 Prices vary according to destination, package dimensions and weight. Transport can be ordered online, as can package tracking. This is an international courier whose website seems like it hasn’t been updated since September 2001, judging from the “effective” price list. Nevertheless, it covers all the basic services: you can order shipments online and calculate their costs. 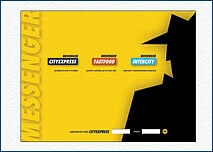 SMS messages and e-mail tracking are additional services. Also, you can determine your package’s location simply, without logging on to the internet. The site also allows you to download forms, even in English, or display maps and locations – which is useful, since there isn’t any information on services and payment methods, so it will be hard for you to avoid visiting or calling. 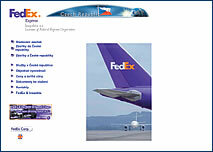 The introductory page leads to three services: the Prague service; express intercity transport; and refreshment deliveries. On the right of the tool bar there is a price calculator, but internet ordering is possible only for registered customers. Ordering refreshments over the internet is conducted as ecommerce, and you can make purchases online or over the phone from more than ten Prague restaurants. Delivery within 60 minutes is the site’s claim, but it took a full hour to receive an answer to a test e-mail. 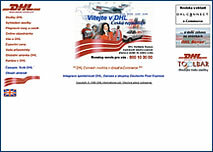 This is a cheerful site of a Prague courier that covers the Czech Republic and foreign destinations. Although a more sober design befits these services, this site’s colors and cheerful balloons serves its purpose. Another nice feature is the option to order business cards online, and the fact that the owner offers references from existing customers, an important and unfortunately lacking feature with other operators. The price list isn’t as well done, it isn’t interactive, and is rather difficult to navigate. There are no additional advanced internet functions. The service unambiguously presents itself as exclusive on its web site. Nice design, flowery information, and an emphasis on reliability, even in non-traditional fields such as pharmaceuticals and comestibles, but little specific information. For example, there isn’t any price list. The only advanced function is package tracking. 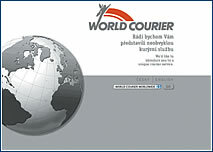 The Czech link at www.worldcourier.com is a bit more informative, but even at this address it’s evident that the site serves more as a business card than as a full-value tool for marketing transport services. The finance ministry has launched a project for declaring road and property taxes, as well as VAT, online. The application that is authorized by a paid electronic signature can automatically scan for mistakes in the declaration. This is a news and general education magazine focusing on digital photography. It includes reviews and a directory of firms in the field. Digimanie is a part of the ProMon publishing house family, as is Hardware World (svethardware.cz). This full-text search engine has been online for some time now. What’s new is that it’s started using the Atlas.cz portal instead of the earlier WebFast technology that was developed by NetCentrum. Search results on the three largest Czech portals (Seznam, Atlas, and Centrum) are all finally different. This consists of internet news broadcasts for the Hradec Králové and Pardubice regions, and in time it should expand to include other areas as well. The reports (which are unfortunately undated) can be viewed in the commonly accessible MediaPlayer program. – An Asymmetric Digital Subscriber Line is a method for transmitting data over a telephone line that is markedly faster than an ordinary telephone connection. In most cases the connection is asymmetric, making it possible to transmit data in one direction at speeds up to 1,544 mbps, with a speed of 128 kbps in the other direction. Thanks to this asymmetry, a high-speed connection can be maintained at a lower cost. This can be used, for example, for downloading or watching a video from the internet. In this country this service is brand new, and for now it isn’t priced very competitively. The monthly fee of CZK 1,500 is a bit higher than either a cable or an ISDN (Integrated Services Digital Network) connection, which also provide high-speed internet connections.